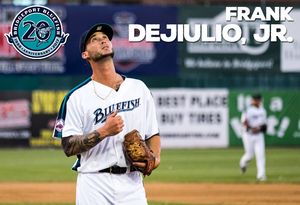 (Bridgeport, Conn., Jan. 31, 2017) – The Bridgeport Bluefish today announced that pitcher Frank DeJiulio, Jr. will return to Bridgeport for the 2017 season. Frank DeJiulio, Jr. returns to Bridgeport for his seventh season of professional baseball and third in the Atlantic League. He joined the ‘Fish midway through the 2016 campaign in a trade with the cross-sound rival Long Island Ducks. In 28 mound appearances, he finished the season with a 4-0 record and a 1.44 ERA with 25 strikeouts in 25.0 innings. The 27-year-old made his professional debut in 2011 after being selected by the Los Angeles Angels of Anaheim in the 38th round of the MLB draft. He spent two years with the Angels organization, playing for Single-A Cedar Rapids during the 2012 season. In 143 career minor league appearances, Frank owns a 16-14 record with 200 strikeouts in 221.0 innings of work.